This recipe is one I made up to duplicate the dish we always enjoyed at one of our favorite NC places, Amos Mosquitos cafe. First I cook some garlic, about 6-8 cloves, roughly chopped in butter. Then I toss spinach in the butter and cover it to wilt, you don’t want it to cook too long. Then I add a about 3/4 jar of chopped sundried tomatoes in olive oil and I add some of the oil from the jar as well. 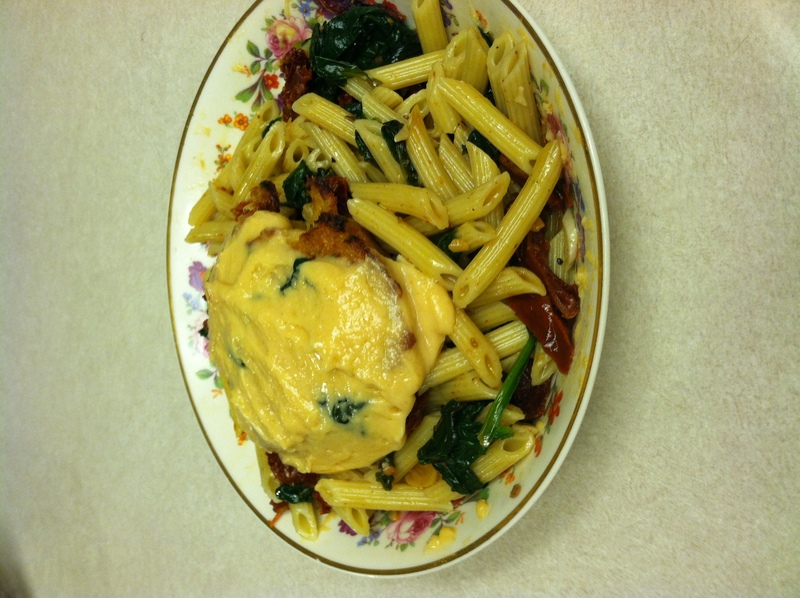 I cook some penne till it is al dente and then I toss it in the saute pan with the spinach. I serve a bowl of this lovely pasta concoction with a crabcake sitting on top and some aioli on the crabcake. Sometimes I make my own crabcakes from scratch but lately I have been using Maryland Lump crabcakes from the freezer section. The crabcake is so happy to be sitting in this pasta nest. Aioli is what really adds the zing to this dish. For my aioli I use garlic, mayo, chipolte peppers in adobo sauce, dijon mustard, and white wine vinegar. I got the recipe from Food Network.com a while ago but I have since added to it. This dish has such few simple ingredients but it is really pleasing to the eye and the palate. It really makes a date night in look extra fancy. tonight I am making this, Sicilian Meatball Stew, perfect for a chilly winter night, and a crowd pleaser! So I am a polenta virgin. I am not ashamed to admit it. I just have never tried it, for some reason it has never appealed to me. Polenta is a very finely ground version of corn grits and if you cook it very slowly to get it creamy. It is often served with tomato and mozzarella or even chilled and sliced into circles for fancy appetizers. I see it on all different calibers of cooking shows and I am usually the first to try to make something if it is more challenging, but yet I have not tried it. 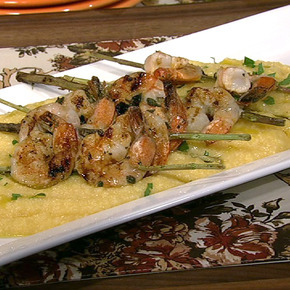 The other day on The Chew, Mario made Polenta with shrimp (shrimp are gamberoni in Italian) and he enticed me. So I bought some polenta and shrimp and I was ready to try it out. Following Mario’s directions were easy and the step by step video helped make my first time making polenta easier. I had seen other chefs use fresh herbs as skewers before in other recipes so I was excited to try this with the shrimp. Remember it has to marinate for 3 hours so plan ahead. Grilling the shrimp on the rosemary skewer really adds delicious flavor, I might use this idea for summer cookouts. Make sure not to grill it too long, you don’t want your shrimp tough, but tender and succulent. Have you ever heard the story of the Mrs. “F” cookie recipe? Somehow the story goes that a woman was in Neiman Marcus or some fancy store and she asked for the recipe to the cookies she was eating in their cafe. The waiter told her it was seven fifty so she said to put it on her card and she got the bill and it was $750! For revenge she gave out the recipe to all her friends. I don’t know if this is an urban legend or not but I always loved that story so I will share the recipe here with you. My Mrs. F cookie recipe is one of my favorites, with double the chocolate and also oatmeal ground to almost a flour like texture, which really adds a great flavor. 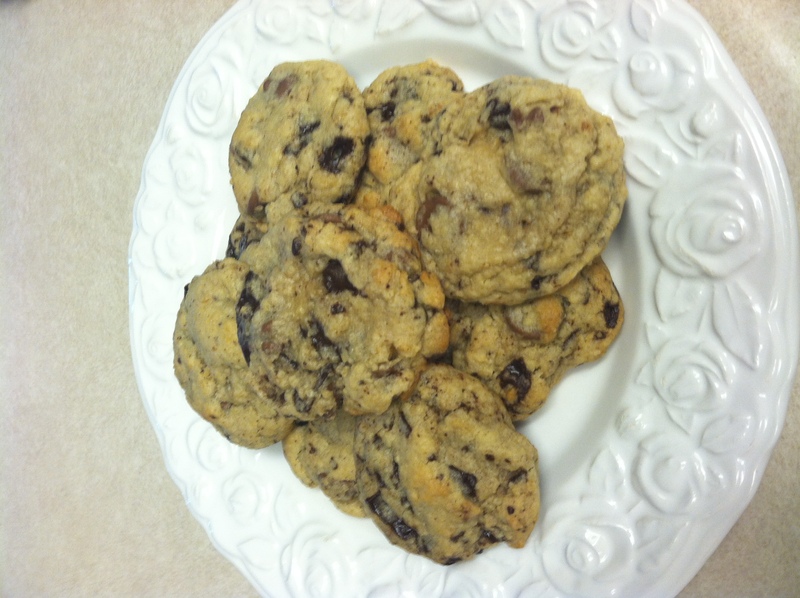 So if you want to change up your typical chocolate chip cookie recipe you have to give this a try! Take 1 1/4 c of oatmeal and blend in blender till it is powder. Set aside. Take a 2-3 ounce chocolate bar and grate in blender or chop finely, set aside. Mix oatmeal powder with 1 c flour, 1/2 tsp baking powder, 1/4 tsp salt, 1/2 tsp baking soda. Combine all ingredients except chocolate and mix well. Add 6oz of chocolate chips (I prefer Ghirardelli) and your grated chocolate and mix by hand. 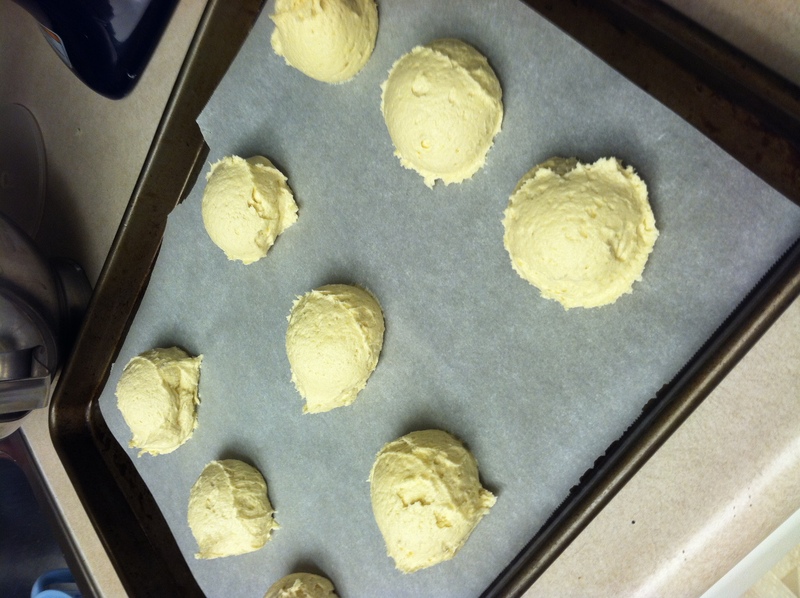 Make into golf ball sized cookies and space evenly on baking sheet. Bake at 375 degrees for 6 minutes. Yum! Forget Papa John’s, we eat Mama Tara’s! Tonight I am making my favorite homemade pizza dough, if you have never made your own dough, you should try this recipe it is so easy and tastes way better than any store bought dough or take out. 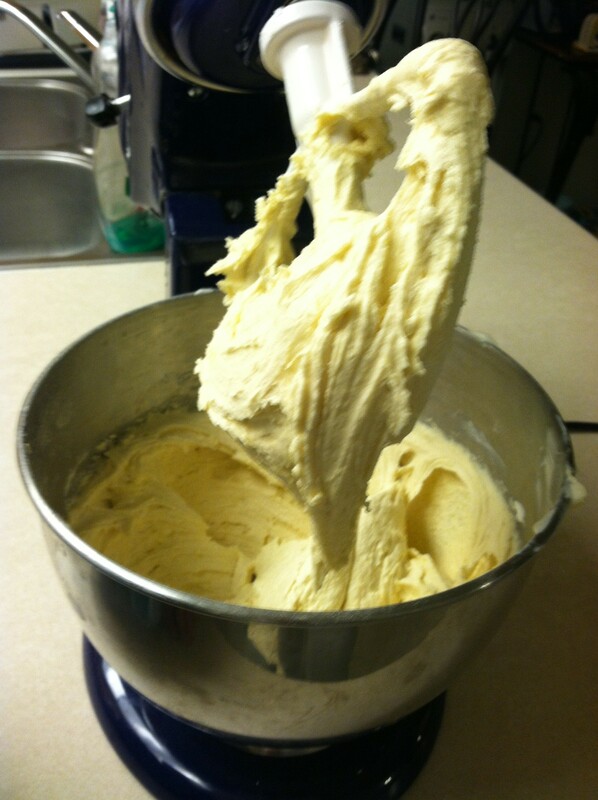 I am going to divide it into three balls of dough so we can each make our own. I will probably make mine into a calzone and the girls can make their own pizzas. So we get to enjoy one of our favorite meals for free and we know what is in it, can’t beat that! 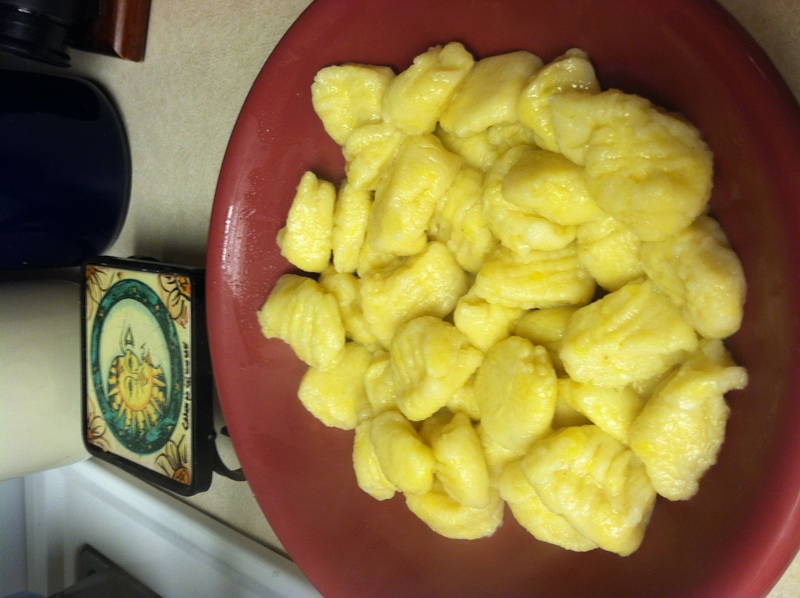 Ok so because I am a perfectionist and I love to cook I had to attempt the gnocchi again. I just wasn’t happy with how it came out. My mom had given me a different recipe to try and so I decided to try it. 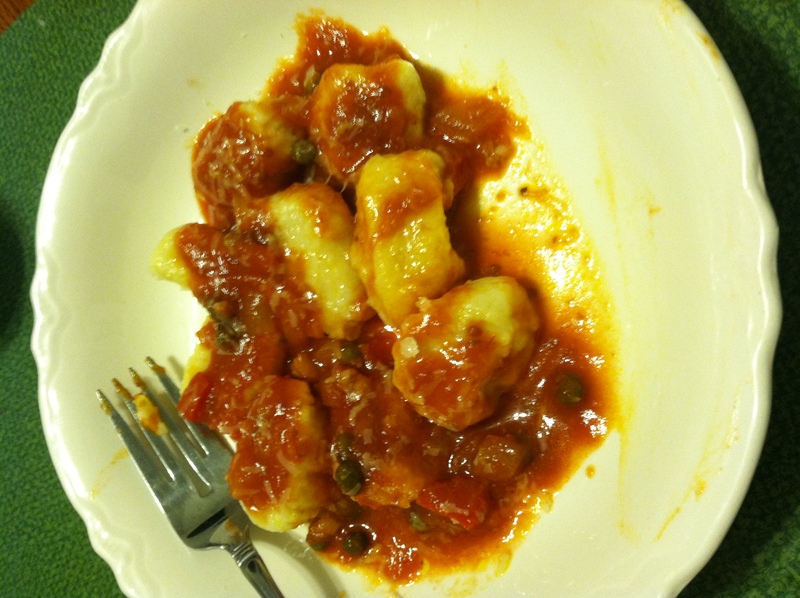 This gnocchi recipe from King Arthur Flour’s website just sounded more delicious to begin with. I didn’t make the gorgonzola sauce but I have made that before for fresh fettuicine and it was to die for. In this recipe, I liked how you microwave the potatoes, rather than boiling them forever, as it instructed in my previous gnocchi post. Also by adding grated cheese to the dough it gave it such a yummy smell, along with the nutmeg (which thanks to my MIL, I had fresh nutmeg to grate). So the dough already seemed to have a big advantage with these additions. 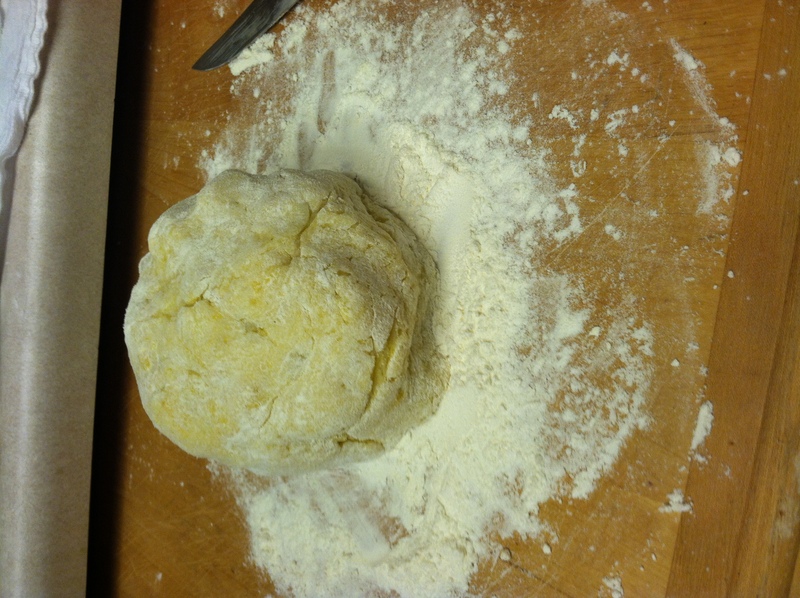 This dough was a bit easier to work with and also cut and roll with a fork, but I still might getting the $5 gnocchi board at the King Arthur Flour store to make it easier, or maybe my handy hubby will make me one. 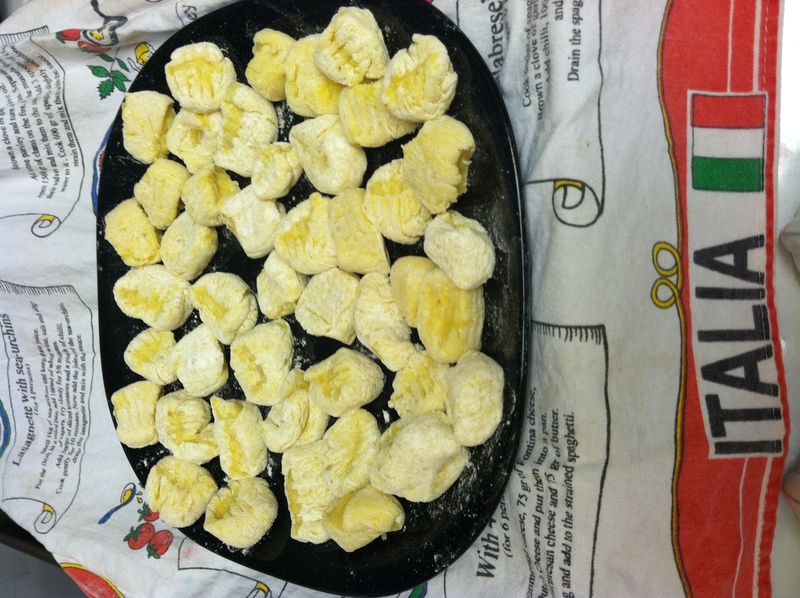 Of course making them by hand gives them a slightly irregular shape but that did not affect the taste at all, we didn’t have a single gnocchi left! I made sure to gently lower them into the water with the slotted spoon and then used the same spoon to strain them, as last time I dumped them in the collander and killed them. Then I tossed them with some olive oil before topping with my cacciatore sauce and pecorino romano. Then we devoured them! So if you liked my last post or you like gnocchi, you have to give this version a try and you too will think this version wins the ultimate gnocchi championship! Oh and it made just enough for me and my 2 girls, but I would have to double the recipe if my hubby were home or we had guests, FYI. Add dry ingredients alternatively with 1/3 cup sour cream. Mix to blend. Use 1/4 or scoop to shape into a ball and then flatten. Bake 12-14 minutes at 350 degrees. Makes approx 20 cookies. Boil this for a few minutes so it really bubbles, as the first time I did it not long enough and it was not thickening as it should have after it cooled, so I made a second batch and boiled it longer. Remove from heat, add 5 cups of confectionary sugar, 3/4 tsp vanilla. Place 2 squares of finely chopped unsweetened chocolate (chopping it is very important, I skipped this step and my whole chocolate wouldn’t melt) in separate bowl and add 1 cup of the vanilla fondant you just made, stir till it melts the chocolate. The chocolate fondant hardens faster than the vanilla so make sure the cookies are ready and cool to frost. This step is no joke because my frosting started to turn to cement right away, so you might want an assistant to help you frost faster. 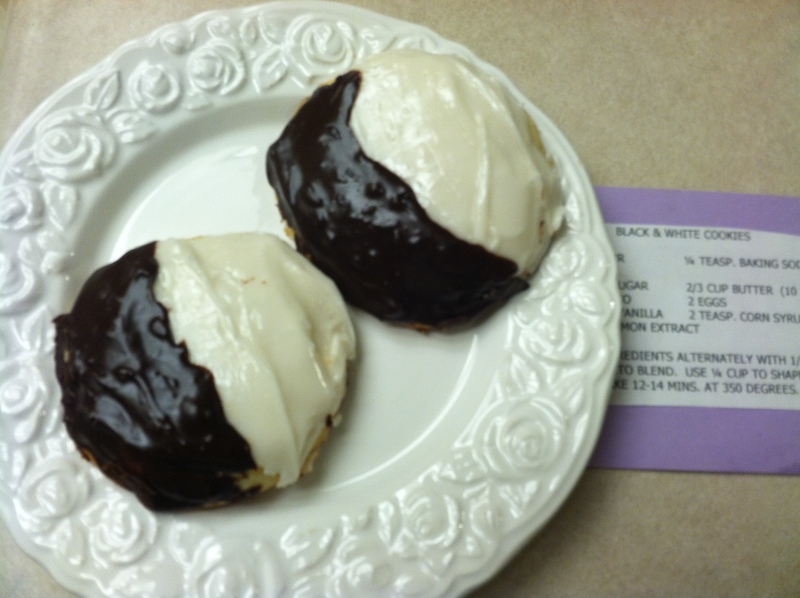 Frost half of the cookie with chocolate and half with vanilla and viola, you have fancy bakery cookies right in your own kitchen! 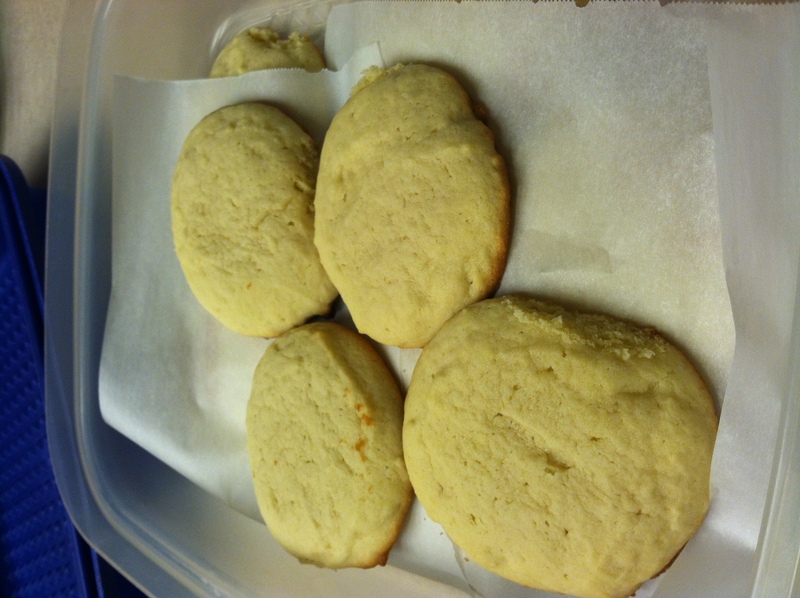 The texture of these cookies is amazing, they are soft and pillowy like cake. But this recipe is very hard and I would say make sure you have the time to follow all the steps to a T, as I was rushing and made a few mistakes. the perfect winter tummy warming dish, manga! 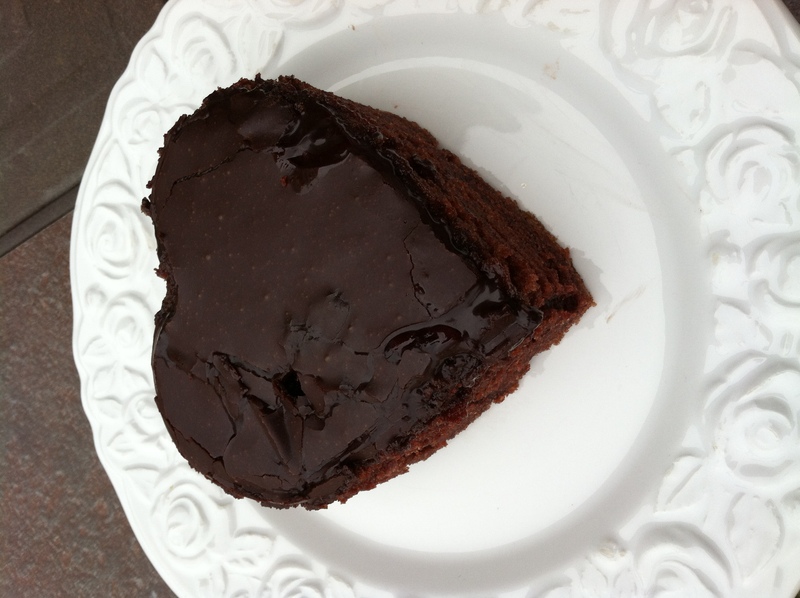 You are currently browsing the What Tara's Cookin' blog archives for January, 2012.